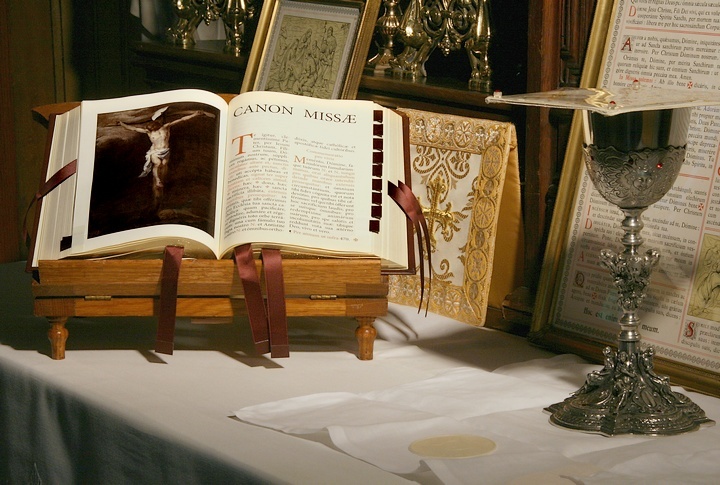 New Liturgical Movement: GIRM 32 and the Roman Canon: The Power of Silence? GIRM 32 and the Roman Canon: The Power of Silence? What precisely is it about the “nature” of the presidential parts that requires them to be spoken out loud? This is a question that has puzzled me for some time, and that I was reminded of upon reading Cardinal Sarah’s book. So, as the GIRM has a footnote in this paragraph, I thought I would take a look at the reference to see if that provides any answer to this question. 14. The priest, acting in the person of Christ, presides over the gathered assembly. Since the prayers which are said or sung by him aloud are proclaimed in the name of the entire holy people and of all present, they should be devoutly listened to by all. 33. Although the sacred liturgy is above all things the worship of the divine Majesty, it likewise contains much instruction for the faithful. For in the liturgy God speaks to His people and Christ is still proclaiming His gospel. And the people reply to God both by song and prayer. Moreover, the prayers addressed to God by the priest who presides over the assembly in the person of Christ are said in the name of the entire holy people and of all present. And the visible signs used by the liturgy to signify invisible divine things have been chosen by Christ or the Church. Thus not only when things are read “which were written for our instruction” (Rom. 15:4), but also when the Church prays or sings or acts, the faith of those taking part is nourished and their minds are raised to God, so that they may offer Him their rational service and more abundantly receive His grace. The underlined section of SC 33 is used in GIRM 30 to define the “presidential prayers” of the Mass. But there is no indication in SC itself that it pertains somehow to the “nature” of these presidential prayers that they be proclaimed aloud. This is a later, rationalistic assumption which has been superimposed onto the text of both SC and Musicam sacram, and is seemingly just asserted to be true. It is also inconsistently applied in the OF Missal itself: the Benedictus es, Domine prayers at the Preparation of the Gifts are normally prayed submissa voce, but if the Offertory Chant is not sung, they may be prayed elata voce. Are they, then, defined as public prayers or private prayers? GIRM 32 also raises serious questions about continuity and rupture. If, as a presidential prayer, the very nature of the Canon demands (exigit) that it be spoken aloud, then what does that say about the organically-developed, centuries-long tradition of the Western Church? Robert Cardinal Sarah, The Power of Silence: Against the Dictatorship of Noise (Ignatius Press, 2017), pp. 129-130. Note that, with the exception of the numbering and the footnote (added for the editio typica in 1969), this paragraph of the GIRM has not been changed in any of its versions (draft or otherwise) from 1968 through to 2002. See the Synopsis of the various versions of the Latin IGMR in Maurizio Barba, Institutio Generalis Missalis Romani. Textus - Synopsis - Variationes (MSIL 45; Libreria Editrice Vaticana, 2006), pp. 389-667 (specifically pp. 422-423). Cf. Tres abhinc annos, 10 (English, Latin). For a very interesting examination of how a trace of this paragraph of Tres abhinc annos persisted in the rubrics of the U.S.A. vernacular OF Missal until 2011, see Matthew S. C. Olver, “A Note on the Silent Canon in the Missal of Paul VI and Cardinal Ratzinger”, Antiphon 20.1 (2016), pp. 40-51. For example: “it is not essential for the entire canon of the Mass to be recited aloud on every occasion. The idea that it must rests on a misunderstanding of its nature as proclamation.” (The Feast of Faith: Approaches to a Theology of the Liturgy [Ignatius Press, 1986], p. 72). Notwithstanding this attempt by Fr Ryan Erlenbush to read the GIRM as excluding the Canon from the “presidential parts”, which I ultimately find unconvincing.